Georgetown, MA, February 4, 2009 - United Foam, a UFP Technologies brand, (NASDAQ: UFPT) a fabricator of custom packaging and component solutions, will be exhibiting at the Medical Design & Manufacturing (MD&M) West exhibition February 10 through 12 in Anaheim, CA. United Foam will be located at booth 2824. This will mark the Company's first time exhibiting at MD&M's annual West event. United Foam serves the medical market by providing highly engineered custom foam solutions including packaging, device components and orthopedic components. With over 40 years of experience in the foam fabrication industry United Foam has gained a wealth of knowledge in creating solutions for medical applications. On display at MD&M West will be United Foam's sterile packaging solutions. 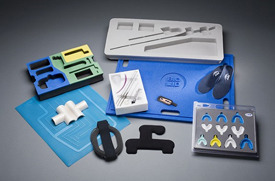 Using cross-linked polyethylene, a sterile foam material, United Foam has fabricated countless packaging solutions for medical devices and medical device components. Multiple clean room facilities (class 100,000 and 10,000) are available for fabricating custom foam packaging. United Foam are experts in fabricating medical device components. Featured at MD&M West will be examples of United Foam's unique foam to fabric compression molding capabilities. One component on display will be the housing unit for an electronic bone growth stimulation device. By combining fabric to foam United Foam created a component that protects the electronic device, allows for it to bend providing a perfect fit to a patient's joint and provides comfort to the user due to the softness of the foam and fabric materials used. A fairly new and exciting facet of United Foam is their access to, and fabrication capabilities of, reticulated foams. Reticulated foams are unique in that during creation the window membranes of their cells are removed. The outcomes of this process provide materials suitable for a myriad of applications including liquid filtration, thermal insulation, gaskets, seals and sound management. Unique reticulated foam solutions that United Foam has fabricated include a defoamer for a blood oxygenator and wipes used in conjunction with sterilizing solutions in clean environments. Formed in partnership with United Foam, United Case™ specializes in creating custom foam interiors for protective cases. A variety of United Case projects will be on display at MD&M West. Specifically for the medical market United Case has created a variety of sales presentation kits. The sales kits' interiors are custom made to provide a perfect fit to a customer's medical device. The case and custom foam insert provide optimal protection during transportation, while also providing an aesthetically pleasing housing when presentation your product to customers. Also featured will be cases that are used to protect endoscopes during shipment. Sterile foams were used to create the interior protection unit that allows for the case to be utilized in a clean environment. United Foam, a UFP Technologies brand, creates high-performance packaging, part and product solutions from an array of foams, plastics and specialty fabrics. Using the industry's most advanced materials and conversion techniques, we engineer unique, cost-effective, solutions for a vast range of critical applications. We have eight fabrication facilities located throughout the US. For more information on United Foam, call (800) 372-3172 visit www.united-foam.com, or email info@ufpt.com.